Welcome to Peterson Air Force Base, home of the 21st Space Wing, the Air Force's only organization responsible for worldwide missile warning and space control. The men and women of the 21st Space Wing provide missile warning and space control to North American Aerospace Defense and U.S. Strategic Command through a network of command and control units and ground and space–based sensors operated by geographically separated units around the world. As host wing for the Peterson Complex, the 21 SW's 21st Maintenance Group and the 21st Mission Support Group provide complete logistical and base support services for Peterson AFB and Cheyenne Mountain AFS, and certain logistics and support functions for Schriever AFB, Colo. Members of Team 21, work throughout the Colorado Springs area in what is known as the Peterson Complex--Peterson Air Force Base, Schriever Air Force Base and Cheyenne Mountain Air Station--as well as 26 locations in 4 countries around the globe. 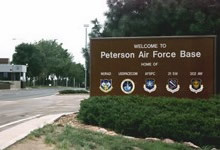 Peterson Air Force Base is adjacent to and east of Colorado Springs off U.S. Highway 24. Colorado Springs is the second largest city in the state and has a population of approximately 500,000 people. Colorado Springs also hosts the United States Air Force Academy to the north and Fort Carson to the south. The Colorado Springs Airport, which shares runways with Peterson, services the area with direct connections to a wide variety of major cities. City buses make stops on Peterson. Space surveillance is a critical element of the space control mission and will be vitally important to support future theater missile operations and assured availability of U.S. space forces. 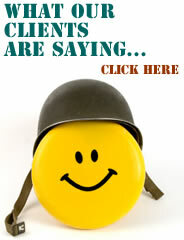 Desert Storm proved once again that whoever controls the high ground has definite military advantage. In addition to its wartime missions, space surveillance is important during peacetime. As part of the space surveillance mission, the wing operates command and control as well as active and passive surveillance units. More than 9,500 manmade objects in orbit around the earth, ranging in size from a baseball to the Mir Space Station, are regularly tracked. Knowing the orbits of those objects is essential to prevent collisions when a new satellite is launched. The 1st Space Control Squadron, Cheyenne Mountain AFS, provide collision avoidance support during each shuttle mission as well as maintain an extensive satellite catalog. This catalog is used by U.S. civilian and military agencies when launching new satellites into space, as well as by U.S. allies. Defense Support Program (DSP) satellites and their associated ground systems and personnel support the space–based early warning system. As the first system to detect missile launches, DSP satellites are critical sensors in the United States' and Canada's early warning system. DSP squadrons send crucial missile and space launch detection and nuclear detonation reports to NORAD and U.S. Strategic Command command centers at Cheyenne Mountain AFS. Members of the 21 SW operate and maintain a complex system of U.S. and foreign–based radars that detect and track ballistic missile launches, launches of new space systems, and provide data on foreign ballistic missile events. Today, ballistic missile warning is critically important to U.S. military forces. At least 20 nations currently have nuclear, biological or chemical weapons, and the technology to deliver them over long distances. According to intelligence estimates, during the next 10 years, several Third World countries will develop the technology and capability to launch intercontinental ballistic missiles at the United States.